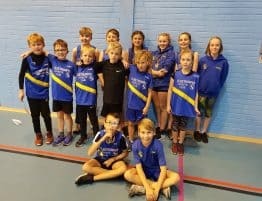 The testing conditions brought the best out of the athletes, organisers and officials alike and the Championships hosted at Beverley Longcroft School were amongst the most successful ever. 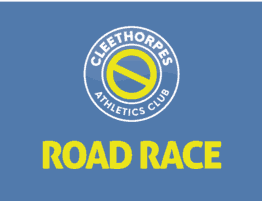 Cleethorpes AC. 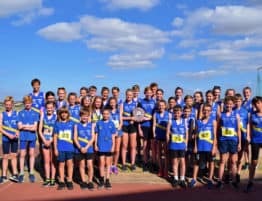 runners who are at school in North East Lincolnshire in Year 8 and above, compete for the N. E. Lincs team against N.Lincs, Hull, and East Riding and from the Championships the first 8 competitors (plus resreves) go through to the Humberside Team for the English Schools Championships. Athletes in Year 7 have their own races but must wait another year for English Schools selection. The Junior Girls race saw the first success for our runners with really fine run from Robyn Greenway in 4th place, (English Schools), and Francesca Yates recovered from injury achieving a very good 9th place (Res.ES.). Amber Laycock ran very well over this course for 32 out of 49 runners.The Junior Boys race again saw success with two of our runners reaching ES. standard with William Gale Bronze medallist in 3rd place and Lewis Phillips taking 4th place after a fine run. The Inter- Girls team (yrs. 9 & 10) brought a Silver 2nd Team Medal to N. East Lincs with Molly Ward running well for 10th (Res. ES.) and Tyra Harrison 34th out of a field of 45 runners. The Inter- Boys team saw a really outstanding result result as Jordan Carlile (ES) won the gold medal over the long hard distance involved. Peter Boyd also had a good race in this event which brought him near to ES. reserve selection. This age group also achieved the Silver Team Medal.Congratulations to all our runners who took part and our thanks to the parents whose support in the conditions was really appreciated. Yesterday also saw our runners who attend Lincolnshire Schools in actions in their Championships leading to the ESAA. Championships and news of their results is eagerly awaited.